London: In the early hours of Monday morning, Badri Narayan passed away in a hospital in Bangalore at the age of 84. Narayan had a successful career not only as an artist and illustrator but also as an art teacher. The artist is mostly known for his narrative and symbolic paintings. He drew heavily from Indian mythology and metaphors and acknowledged the influence of the Indian miniature tradition in his works. The artist believed in the two-dimensionality of painting, and preferred to work in a smaller format; one that he found practical and well suited for the watercolours that have been his preferred medium for several years. Narayan had also worked with etchings, woodcuts and ceramics and illustrated some children’s books. 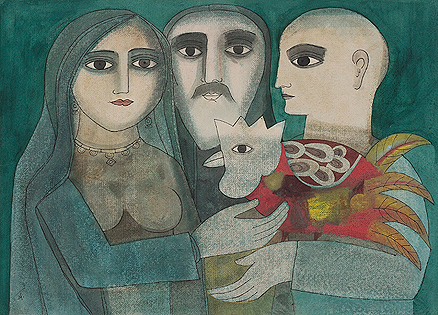 Narayan exhibited his works for the first time at the Hyderabad Art Society in 1954 and since then he had more than 50 solo shows. His creativity will definitely be missed.